Apple recently activated a program allowing merchants to order Apple Pay decal kits to dress up shop windows and registers, which raises customer awareness of where Apple's payment service is accepted. 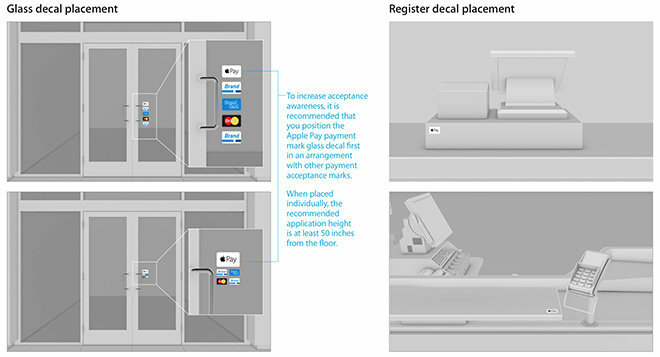 Apple Pay decal kits, which include two sizes each of glass and register decals and an application tool, are now available to order through Apple's Merchant Supplies website. The kits are free, though shop owners needing more than five are instructed to place their order by calling a special toll free phone number. In an accompanying Payment mark Guidelines document, Apple suggests retailers display the decals prominently in store windows or glass doors to advertise Apple Pay compatibility to passersby and customers. Instructions recommend positioning the Apple Pay mark at least 50 inches off the ground and first among an arrangement of other payment acceptance marks. The document goes on to outline digital design principles for point-of-sale terminal screens, online advertising and company websites. The decal kit is another building block in Apple's nascent mobile payments rollout that first saw activation on iPhone 6 and iPhone 6 Plus devices in October. A recent study polling iPhone 6 owners found only six percent of users tried the NFC version of Apple Pay, while another 85 percent have never even played with the service. Nine percent of respondents said they experimented, but forgot how to use it when making a purchase or didn't know where it was accepted. Apple's new decals are designed to address the latter. Apple is slowly adding to a running list of merchants that support Apple Pay and earlier this month announced 14 new partners including Jamba Juice and Office Max.